Thank you for visiting! Check out my latest newsletter, view photos from The Relief Bus outreach, watch a video about my work, read my story, and more! Also be sure to check back often for an update on my life and ministry! The Relief Bus is a mobile soup kitchen and resource center serving the poor, homeless, and addicted on the streets of New York City. 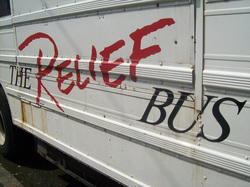 Operating out of two converted school buses, The Relief Bus serves delicious soup, bread, and drinks to those in need. In addition to a hot meal, Relief Bus staff and volunteers spend time building relationships with those we serve, working to connect them to vital resources such as shelter, food, clothing, alcohol or drug detox/rehab, churches, etc. Through it all, we look to take Jesus to the streets of New York City, bringing His hope, peace, love, grace, and mercy to meet the desolation, isolation, pain, fear, addictions, and death so prevalent in this world. I am serving as the volunteer coordinator for The Relief Bus, meaning I schedule and coordinate the thousands of volunteers who come to serve with us each year. In addition to this, I do some video work (gotta use my education! ), and serve on The Relief Bus at least two days a week! All this work keeps me busy, but I love it! If you would like to learn more about The Relief Bus, including our history, how to get involved, or how to give financially, click here. Is not this the kind of fasting I have chosen: to loose the chains of injustice and untie the cords of the yoke, to set the oppressed free and break every yoke? Is it not to share your food with the hungry and to provide the poor wanderer with shelter — when you see the naked, to clothe them, and not to turn away from your own flesh and blood? Then your light will break forth like the dawn, and your healing will quickly appear; then your righteousness will go before you, and the glory of the LORD will be your rear guard. Then you will call, and the LORD will answer; you will cry for help, and he will say: Here am I. If you do away with the yoke of oppression, with the pointing finger and malicious talk, and if you spend yourselves in behalf of the hungry and satisfy the needs of the oppressed, then your light will rise in the darkness, and your night will become like the noonday. The LORD will guide you always; he will satisfy your needs in a sun-scorched land and will strengthen your frame. You will be like a well-watered garden, like a spring whose waters never fail. Your people will rebuild the ancient ruins and will raise up the age-old foundations; you will be called Repairer of Broken Walls, Restorer of Streets with Dwellings.